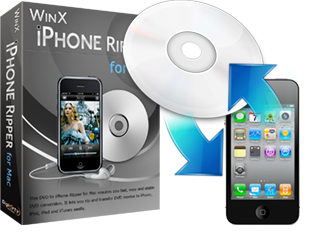 WinX iPhone Ripper for Mac is specially designed to rip and convert DVDs to iPhone in a fast and stable progress. Support converting normal DVDs, CSS protected DVDs, Sony ArccOS and Disney encrypted DVDs, all region 1-6 DVDs to iPhone/6/6 Plus/5S/5C, iPad Air 2/mini 3, Apple TV, iTunes, MP3/AAC/AC3 audio and PNG picture formats. Download WinX iPhone Ripper for Mac to watch any videos on iPhone/6/6 Plus, iPad, iTunes anytime anywhere! Your download should begin shortly. Otherwise, please click the download button below manually. Convert HD video MTS, M2TS, MKV, camcorder videos and AVI, MPEG, WMV, MP4, FLV, MOV, VOB, etc. to iPhone on Mac OS X Mavericks/Mountain Lion/Tiger/Leopard/Snow Leopard. Work well on your PC, rip DVD and Normal DVD, CSS protected DVD, Region protected, Sony ArccOS or other encrypted DVD to iPhone, iPad, iTunes and Apple TV. This iPhone ripper provides me high quality conversion of watching movies on my iPhone. The DVD action movies of TransporterⅠ, Ⅱ, Ⅲ are easily converted to iPhone, and now I can enjoy the show of Jason Statham. After trying this software, I give up all the other rippers for my iPhone. To me, ripping in a high speed and presenting the high quality conversion are the biggest features of this Mac iPhone ripper. Meanwhile, I still get the picture gallery from the videos.